Warning: If I ever find out that the pictures displayed on this page end up on someone's website without my consent, or if some people try to remove the watermarks and try to resell these pictures, they will have to provide some good explanations. I will then have to remove my pictures and other visitors of my website will be deprived of them! I didn't expect this one; Bon Jovi at the Festival d'été de Québec while they are not on tour! 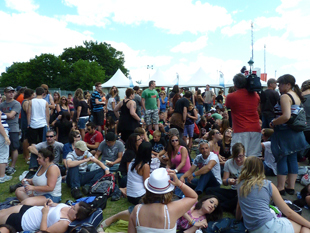 However, who says Festival d'été de Québec also says general admission, endless wait just to have a good spot, sand on site which goes everywhere, dehydration, food deprivation for a few hours, without taking into account body conditioning to hold urine for several consecutive hours not to lose our place, as well as consequences of dehydration spanning over several days after the show... Let's say it, I was already stressing out and the passes were not even on sale! Fortunately, I was telling myself that I was not pregnant, because I would have never been able to face all of this while pregnant! I so hoped that the fan club would spoil us by giving us the chance to enter before the others. Some members, me included, were also ready to pay a little extra for an "early entry"! 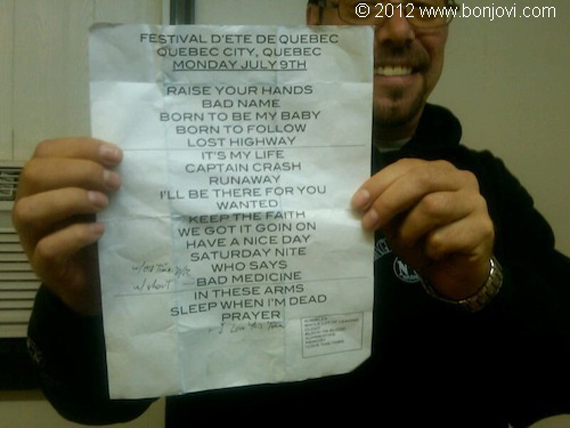 However, a few weeks prior to the show, Jon's brother, Matt Bongiovi, let everyone know on the internet that the fan club had no control over this, it was the Festival d'été de Québec who decided everything... Let's say that my hopes vanished quite fast to get my wish! When I came back to work at the end of May 2012 after spending a year on parental leave, one of the first things I told my supervisor is: "Forget me on the upcoming July 9 and 10, I'm taking a leave of absence!" He told me with a little smile on his lips: "Bon Jovi will be in town or what?!" When I answered yes, he seemed surprised that it was the real reason, but as comprehensive as he is, it was out of the question that he wouldn't let me go anyway! I'm known at the office to be a very big Bon Jovi fan, so nobody dares telling me that I cannot go to a show and usually, people encourage me to go! Several weeks prior to the concert, I started working out for this show. The new thing compared to previous workouts was to add a little part of jogging outside under intense heat. I told myself that I had to be able to run at least on a long enough distance to have the chance of being close to the stage. A few days before the show, I was proud of my cardiovascular condition, because I was able to run quite quickly on a respectable distance. My coworker and friend, Sonia, and her daughter Marie are used to waiting lines for general admission shows, because Sonia is as big of a U2 fan as I am of Bon Jovi and U2 shows are presented in general admission on the floor. Sonia prepared me mentally to have to run like crazy, but not to worry, because I would be up front if I arrived early at the waiting area on the morning of July 9, 2012. However, her experience with LMFAO a few days before the Bon Jovi show was quite like a cold shower to me. She had arrived at 6ham in the morning to wait, she was 6th in line and because of extreme craziness of the people on site when the doors opened, she ended up being very far away from the stage. She was very mad when I talked to her on the phone the next day! All of this made me freak out even more, but at least, I knew that it was not worth it to go wait on site from dawn to find myself either up front if I were lucky or either very far away if security lost control over the crowd immediately after the doors would open like it had been the case for LMFAO... I was resigned to be very far away from the stage, despite the fact that I had not been a lot farther than 50 feet from the stage at a Bon Jovi show over the last 11 years... In fact, the last time I had been farther away than that was in May 2001 when I went to see Bon Jovi in Quebec City! After our walk on the site, we finally got in to go see the Bell stage from closer. There were a lot of people!! A lot of young families as well, it really surprised me. With the decibel level there, I find parents who bring their babies there a little negligible, because I didn't see a lot of babies with ear protection devices. We checked out the best spots, that are on the hill at the back completely to see the show only on the giant screens because the stage was really too far away (a thing that I didn't want), close to the stage on the right next to the barricade that divides the ZAS from the zone for the general admission (of course, everyone wants to be there!) and at the barricade right behind the ZAS where nobody blocks the view of anyone in front and the stage is still visible enough. We went back to the hotel, because I also wanted to rest in anticipation of the following day and I had had enough of smokers who had poisoned my air the little bit of time we were there. Sonia and Marie were going to Jean Leloup's show and they stopped by our hotel to talk to us a bit. They confirmed that the best spot after the area near the stage was the barricade behind the ZAS. They also told me to bring good shoes not to hurt myself during the super run. They also explained to me in more details what was happening when the doors open and it was scary! In short, we went to bed at a reasonable time and I was able to sleep a little, even if adrenaline was slowly starting to pump in my veins... I had already planned to try to travel lightly to go wait until the doors open not to hold me up with a big bag and the search that security was doing with those who had bags or big purses. I had decided not to wear my contact lenses, because the sand on site was very fine and it had already gone everywhere in my nostrils and my mouth during the time we had been there the day before. I couldn't even imagine how it would be if I wore my contact lenses in such an environment for about 5 hours!! The temperature was perfect in the morning of the concert and the weather forecast predicted good weather, not too hot (25 degrees Celsius) and without humidity! At least, there was a positive thing! My nerves almost gave up on me several times during the morning; I had to get a hold of myself and calm myself. I was freaking out, literally! I would have thought that I would be calmer a few hours before my 19th Bon Jovi show, but no, I feel the same agitation in the morning of a show! Bon Jovi, my sun that blinds my thoughts to such a point that I couldn't do anything but run in circles in the hotel room in the morning of the show without necessarily doing anything smart! I was still able to prepare the things that I wanted to bring to survive the whole time I would be in line with the other fans. Time seemed stopped, but at the same time, everything went by very quickly in my head! We could have said that I had drunk 5 coffees, I was a nervous wreck! I had decided to wear a black tankini (a quite long bikini top, it looked like a tank top) and shorts that I had bought especially for the occasion. We left to have lunch at McDonald's on Grande-Allée around 11h25am. On the way, I received a text message from Sandra telling me that she and her boyfriend had arrived in Quebec City. I then told them to come join us. We ran into each other on Grande-Allée, not far away from the restaurant. We took the time to eat and we left at 12h30pm. I put on sunscreen, not to turn as red as a lobster, because the sun was fully shining, before going to wait. When we arrived, we saw that about 200 people were already on site. It is an approximate number, because there were people sitting everywhere, a few standing up, but all in all, we were not far away from the entrance. Sandra and I settled down on the ground while the guys stayed up a little with us before heading off to walk a little to kill time. I sent a few text messages to people who were supposedly already there and others who were coming, like Sonia and Marie. A few minutes after settling down on the ground, I saw a woman in front of us who looked familiar. I was pretty sure she was a fan whom I had met back in the time I was chatting on the internet at university, but it was so long ago since I had seen her that my memory made me doubt myself. At the same time as I looked at her a second time, she looked at me and she was also looking at me like she knew me. We almost talked at the same time to ask ourselves if we knew each other. It was indeed Marilyn whom I had met at Université de Sherbrooke! The last time I had heard from her was at the Bon Jovi show in Montreal in February 2003 when she sat behind José Théodore and Stéphanie Cloutier! When I recalled this event, she said: "Yes, that's exactly it! You have a good memory, even my friend didn't remember it!" Her friend was beside her, we quite laughed! We got each other's news and it was really fun to talk to both of them for a few minutes. Among others, I told them that I had gone to a Bon Jovi show while being 35 weeks into my pregnancy, a thing that Marilyn found very impressive. I repeated my story about the banner that I had made for the occasion in May 2011 and Sandra could testify once more that she had rarely seen such a reaction from Jon when he saw it! I could see that the women behind us were also interested in hearing the story, because I could hear them react at the same time as Marilyn was reacting! Sonia and Marie arrived about 45 minutes after us. Sonia sent me a text message when they arrived, because they could not see me. As soon as I got up, they saw me, because they were almost right beside us! After talking to them a few minutes, they decided to stay close to an access corridor on the street, while we were near the access corridors on the grass. There were several access corridors in parallel separated by yellow and orange posts and according to Sonia, all these corridors would fill up before the doors open and all these corridors would open at the same time, from which the fact that even if a person is the first in line, if she doesn't run fast enough, she is not the first up front, because another person in another corridor has the same chances of getting up front, even if this person arrived at the front of the corridor later in the day... Do you now understand why I was not in a hurry to arrive there? I knew that if I ran fast, I was confident that even if I were farther, I could outrun a big bunch by starting to run after the corridors! I took a few pictures during the afternoon to remember the crowd a little. Everyone was chilling in the middle of the afternoon. The entrance was where the white tents were located. The spot where we were when we were waiting to enter the site. The crowd was a lot more compact! A short while after sitting down, I saw Afsha, a friend from Toronto, who was further to the left. I sent her a text message to tell her that I was there, that I was wearing a big straw hat (paid 9$ at Walmart, it was really ugly, but it was large enough to hide my face, my neck and a part of my shoulders from the sun) and I was not far away from her. A little later, I could not see her anymore, and she wrote to me to tell me that she was looking for me. I then stood up and I saw her with a black and white hat. I took off my hat and I waved at her. She saw me and she immediately came to see me. The last time we had seen each other was in Toronto in 2008 before going to a wedding in my family-in-law, so I still had my braces at that time! We chatted a little, she didn't know that I was the mother of a boy. When showing her a picture, she thought he was quite handsome! We talked a little bit longer about babies and I was pleasantly surprised to know that I was not the only woman in the world to plan a pregnancy depending on Bon Jovi tours to avoid being pregnant as much as possible during a tour. I told her the story of when I went to a Bon Jovi show while being 8 months in my pregnancy, and despite the fact that being pregnant is not a disease, I told her: "Never again if I can help it!" I would not want to have to relive such an experience! Anyway, she was with a friend, they had flown instead of driving to spare time, because for them, it was a nice road trip from Toronto to come to Quebec City! A woman near us had a camera with detachable lenses. On the Festival's website, it was written that professional cameras with detachable lenses were forbidden. Sandra made the comment that the woman would probably not be able to enter the site with her camera. Lucky for her, people from security were going around in the crowd and shortly afterwards, a woman from security came to warn her that she would not be able to enter with this kind of device. I found it nice for security to warn people in advance for this kind of things! At some point, Sandra told me that she had gone to New Jersey last fall. She and her boyfriend go there several times per year. She went to see the JBJ Soul Kitchen restaurant which was not opened yet. To her great surprise, Dorothea, Jon's wife, came out of the building when they passed by! Sandra told me that she talked to her for several minutes. I was very curious to know how she is in real life, because we see her or hear her on television in very rare occasions. It seems like she is really kind and that she is even more beautiful in person. I didn't expect Sandra to tell me otherwise. Since I was a teenager, I have a really great respect for this woman and I hold a place in my heart for her, almost as much as for Jon. I have always admired her for who she is: a woman committed to her community, she is also the great woman behind my idol, the one who supports him, the one who has always been by his side, the one who has made him the man so many people admire, in addition to having a black belt in karate (so she is a woman who is in top physical shape). Anyway, I would be much honored to meet her one day, because she was and still is a role model for me! There were quite a lot of representatives from the press who were in the waiting area and I saw a few who were interviewing people in the crowd. Another representative from Radio-Canada (CBC) filmed the crowd a few times during the afternoon, probably to get some images to show on the news. He passed by near us a few times by pointing the camera in our direction, but I don't know if we were on television, nobody told me anything about this up until now. I also saw another representative make a bunch of fans sing not far away from us. In the afternoon, Sandra was checking messages posted on Tweeter and she showed me that Richie had just posted a tweet to say that he was leaving New Jersey soon for the "Quebec City gig". He was not too stressed out! I learned afterwards that the band arrived in Quebec City only around 6h30pm and that the band members left Quebec City immediately after the show. I also heard that one of the reasons why they could not stay too long is that Richie was still working in the studio for his solo album that was supposed to come out soon. Anyway, I sent him a couple of emails to explain to him that I would not be able to talk for long, because I had a cellular phone from the Montreal area, that it would cost me long-distance call fees and that it had to be soon, because otherwise, I could not guarantee that I would be able to talk to him if he called at 5hpm while I would be stuck in the crowd! I left him my cellular phone number for him to call me, a thing that he did a few minutes after my last email. I was then telling people around me that I would do an interview! My phone rang, it was a number with regional code 418, so I answered right away. I spoke with Martine, the cohost. She told me that they would record my interview and that it would air at 4h30pm only; it was then 2h50pm. She gave me an overview of the questions that she and Dany (the other host) would ask me (as if I needed to prepare to talk about my passion for Bon Jovi...) and she then transferred me to Dany while she prepared her computer for the recording. He confirmed with me that I was still working at the Canadian Space Agency; it is written on my website, they did a good research work! Strangely, I was not that nervous, but I was just afraid of not hearing well, because music was playing near where I was in addition to the recording of the instructions for the opening of the doors which was then playing and all the people who were talking nearby. Even if I had gotten out of the crowd during the interview, there were still noises everywhere! Since when are you a fan? How many times have you seen the band in concert? Have you ever met Jon? Do the band members know that you made a website to describe your passion for them? Are you part of the group of fans who are waiting since 36 hours to enter the site of the Festival? What seduced you at the beginning when you discovered them? Why do you still follow them today? Describe to us how Jon is on stage; is he born for the stage? Have you seen them in concert outside of the country? Is it the first time you come to the Festival d'été? This is about what I remember. In addition to my answers and the stories I told, the interview lasted a few minutes and can be listened to (in French only) by using the following plug-in or by clicking on the "Download" hyperlink below. Note: The whole show of that day is available on Radio X's website (in French only). Martine and Dany are part of the 5 to 7 team who does the Le Retour de Radio X show from 3 to 6 for the summer 2012 (Le Retour de Radio X being a distinct show from theirs normally). Thanks to them who allowed me to use parts of their show for my website's visitors! For those who didn't listen to the interview, Dany started off by saying to the listeners that they had the chance of having on the air a very big Bon Jovi fan, an engineer working at the Canadian Space Agency, no less! I hadn't even started answering questions that I was embarrassed! He seemed surprised to know that I had never met Jon. Dany insisted on that fact, let's say that I thought for a fraction of a second that he would tell me on the air that I had won something! I told myself that at the end of the interview, I would ask them if they had ZAS passes for me, in return for the interview, but the line cut when we said goodbye at the end of the interview! Ah!!! I tried to call back, without success. I sent an email to Dany right after, but he only answered me the next morning to tell me that they no longer had passes the day of the concert. Anyway, going back to the interview, I said that my favorite song is Bed Of Roses, I said that I had listened to the song 3876 times in one year when I was 12-13 years old and that I brought a banner about it with me at concerts and that Jon even took a bow at me in New Jersey in 2010 because of the banner. I stumbled on some words, but overall, I am very proud of myself. The answers came out quickly, I talked with my heart and I hope that it showed on the air! Dany even said during the interview that I had a website with my reviews, my pictures and my videos and he asked me if it were possible to give the address to the listeners! My god!! I cannot wait to see the increase in traffic on my site! I was finally able to know what the part of my website about Bon Jovi could be useful for apart from entertaining the fans who want to see what I write and what I am able to do with my camera in concert! Who knows, maybe someday, my wish to meet them will come true because of my website? Anyway, towards the end of the interview, I said that I was hoping that the show that night would make new people discover the band and they will want to go see other Bon Jovi shows after seeing them in concert once! When I hung up, I told myself that I had never been happier to have my smart phone with me! When I came back in the crowd, the guys were back next to Sandra. My husband asked me how the interview went and he asked me if I needed him to go to the hotel to take a few things back, because we had told ourselves that he could go back to the hotel in the case where I didn't want to bring everything on site. He also asked me if I still wanted a Subway sandwich for dinner, because he and Sandra's boyfriend would go get dinner soon, even if it were only 3hpm. Sandra's boyfriend had the feeling that it would not be long until the crowd would bustle about. Sonia had told me that the deadline to go to the restroom before the craziness took over was quite 4hpm. I tried to reassure him, but he thought that there were already a lot of people standing up and we were starting to see that there were a little bit more people around us... The guys had just left when several 16-17-year-old young people (who had drunk beer all afternoon, by the way...) started getting in front of us. It was clear that the crowd behind us had decided that it was already time to go get in line near the access corridors... A woman in front of us, who were still sitting down, started to scream: "Hey, there are still 3 hours before the doors open! Relax, we still have time!" The people around, including me, gave a round of applause for the woman's intervention. We even screamed our approval! But there was nothing to do, the young people were already invading us and Sandra and I just had the time to pick up her towel, my cushion and our stuff on the ground that we found ourselves among a flow of young and not-so-young people who had not spent the afternoon with us at all! We were so close to one another that it was suffocating! Even more that it was hot and the sun was beating down on us, in addition to the people who were so close to us that we could almost feel their breath on our neck and our hair... I really thought I would die there! I could clearly see that Sandra was not comfortable either, so I told her that we'd better get out of there before suffocating for real. Anyway, we could have never eaten in this crowd! We then got out of the flow of people to head to the grass on the other side of the street where people who got stuck in the crowd like us settled down to breathe a little. I would have never seen myself wait in the crowd that we had just left during 3 hours before the doors opened!! I love Bon Jovi and I would be ready to do a lot of things for them, but I mostly wanted to go to the concert in one piece instead of spending it at the infirmary on site! We were very relaxed on the other side of the street and the crowd on the left side seemed really determined to stay standing up for a few hours! When the guys came back, I ran after them, because they seemed to wonder where we were now! We then ate quietly on the grass; I was happy to have dinner (even if it were probably only 3h30pm), because I had minded myself to eat nothing but almonds and drink Boost throughout the rest of the day! Sandra and I went to the restroom at around 4h15pm, after her boyfriend noticed that the crowd was becoming denser on our side as well. More and more people would come sit on the grass and the crowd who was waiting to our left for the access corridors was only getting larger. I was impressed to see that, but it was really scary! I could see with my own eyes at that moment everything that Sonia had told me of her experience at LMFAO. Most people in line were teenagers, clearly not the usual crowd at Bon Jovi shows! 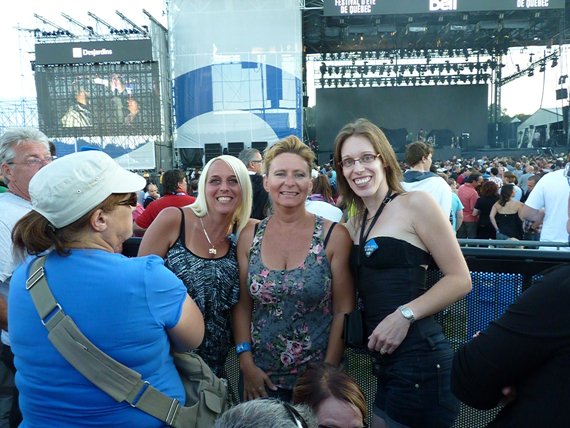 But then, they had the chance to see Bon Jovi at a good price (66$), so they wanted to take advantage of it! There were also people of our age and a little older who were waiting, I don't know how everyone was able to wait standing up in the full sun for that long without passing out! When I went to the chemical toilets, I told myself that it was the last time I was going to the restroom before going back to the hotel after the show. This only thought might as well have stressed me out enough that I would have had to go to the restroom again half an hour later!! After coming back to where we were before, I received a text message from Geneviève asking me where we were. She and Maryse were supposed to arrive later in the afternoon. After a few minutes, we saw them arrive! They were close to the chemical toilets and we didn't even see them! We talked to them for a few minutes; they had arrived not long before. They then returned to their place to finish their dinner. Around 5h20pm-5h30pm, someone from security came to tell us, as well as people who were waiting around us, that it was time to get up and get in line in preparation to the opening of the doors. I quickly put on my sneakers while keeping my sandals in my hands, I put my camera around my neck and I went to put my hat, my cushion and the rest of my sunscreen in the trash can near us, because I had no intention carrying them with me all evening! I already knew that it was a sacrifice to buy them last week (I had already used most of my sunscreen anyway). The goal was to have as little things as possible in my purse and my hands to avoid slowing down my run. I also turned on the light of my lapel badge of the Festival at that moment. With a 35-hour autonomy based on the information received with my bracelet and my lapel badge, I told myself that there was very little chance that the light would faint before the end of the show! My husband took out his iPhone to show us a picture taken from the air of the site of the Festival so we could establish a game plan when the doors would open, like in a football game! It was funny, we were all 4 gathered in a huddle to understand each other on the direction to take once on the site. Sonia had told me to head towards the left when going down the initial slope of the hill at the back of the site, to pass the huge speaker (which was dead center on the field) towards the left to arrive at the black barricade right behind the ZAS and VIP zone. With the amount of people ahead of us in the crowd, we clearly knew that we would have a hard time being close to the stage on the right where the general admission started, on the right of the ZAS. One thing is for sure, I was really happy to know Sandra's boyfriend in that crowd, because he always commands respect from people and I knew that nobody around would bother us. Precisely, he was always saying that if somebody bothered us, he could arrange something so they would leave us alone! We started going forward at around 5h45pm, 15 minutes before the doors officially opened. The song called Thunderstruck of AC/DC started to play a little bit before people started entering the site. I now wonder with this whole mascarade if the organization of the Festival d'été de Québec did not precisely prefer seeing thousands of people starting to run at the same time in total chaos instead of trying to find a fair way for everyone to follow a little bit the order in which people arrive in the waiting area... Anyway, I was expecting to be pushed, but no, people had still enough discipline to get to the posts and in the access corridors. We were packed in like sardines, Sandra's boyfriend was in front of me and my husband was on my right. I opened my purse (which was practically almost empty) to pass by the search area quickly. The guy who searched the bags quickly went through the contents of bags and when he got to mine, he looked at it for a fraction of a second and he told me: "Go, it's ok!" I stopped in front of a woman who was scanning the bracelets of the Festival and I showed her the part where the chip was to speed up the process. When she told me that it was ok, Sandra's boyfriend was already running in front of me, I simply told him: "Go! Go! Go!" He slightly stepped aside and I was able to pass him quite quickly. I couldn't see my husband beside me and I started to run as fast as I could, while lowering my head to see where I was stepping not to get caught in something. To this day, I swear to you, I have never run faster in my life and even if I had had a wolf chasing after me, I would have never been able to run faster! I was passing most of the people in front of me and I just barely had the time to look to my left for a fraction of a second to see several young people (still a lot more in shape than me!) hurtle down the hill like gazelles. I then looked in front of me and I saw that I was almost passing the huge speaker on the right. I rectified my path to cut to the left to head towards where Sonia had told me to go. I was then out of breath, my chest was burning, I'm suffering from asthma when I make intense physical effort. I slowed down my speed and my husband caught up with me. He encouraged me, because he was then running faster than me and he found himself in front of me in a few seconds. He gave me the motivation which was beginning to lack. I then told him that I was no longer able to run faster and I think that he told me that he didn't doubt it with the speed at which I started running in the beginning. I told myself at that moment that I should have given a few of my things to carry to my husband for the run; he didn't have anything in his hands while I had the rest of my things in my hands! It's a little normal that I had to slow down! When I arrived at the black barricade behind the ZAS, I could see black spots that blinded my vision... I was able to regain control of myself; I was starting to be weak! No no no, I especially had to not lose consciousness after all this run!! When I came back to me, I noticed that there were one to two rows of people already there. I started looking for Sonia and Marie. I saw them, they were on my right. I then tapped on Sonia's right shoulder, she turned around and when she realized that it was me, she stepped a little to the left to let me go at the barricade. The woman behind her didn't find it funny and she said that she was against me passing through. Sonia then grabbed me by my left arm while saying to the woman behind her: "We were saving her a spot! Come here!" while pulling me towards her with conviction. I then ended up at the barricade within a second, I was completely out of breath! My husband stayed behing me and I saw Sandra and her boyfriend arrive shortly after. Sandra was behind Sonia on her left. It took me a good half hour to recover physically and mentally from my run. When I turned around, I realized the distance I had gone; it was much longer than my street! It's normal that I had choked at the big speaker! My hands were trembling because I had given everything I had, Sonia thought it was a little funny! I had enough space at the barricade to put down my purse, my sweater and my sandals. I even didn't have a hard time squatting down. For that matter, I squatted down for a few minutes to be in the shade a little, but I was really drained. I was so hot and I had a lot of secretions in the throat, in addition to the burning in my bronchial tubes. After telling Sonia that I had to pay her a meal for everything that she had done for me in the last days by encouraging me and by telling me where to go, how it worked in the waiting lines for the Festival and where was the best spot not to get knocked about and still be close enough to the stage to see everything without necessarily always having to rely on the giant screen, I told her that my feet were really hot. She then told me that nothing prevented me now from putting my sandals back on. Fortunately, I was able to do it by wriggling myself a little once squatted down to take out my sneakers, my socks and to put on my sandals afterwards. Sonia helped me tie my sneakers to the strap of my purse, because I didn't even have the energy to think how to do it. She told me as a joke that I could be in the television commercial on New Brunswick (Marie-Hélène, you are an engineer! ); we quite laughed, because I probably felt like a person who turns the switch off so much from reality that even the slightest little task is impossible! Before I got up again, I thought about where I was; I had seen this scenario so many times in my head since the last days and it came true in a very similar way as I had envisioned. I freaked out for a few seconds, but I was able to get a hold of myself, because I think that I would have cried a lot otherwise! Shortly after, Michel, the very kind man who was on Sonia's left (and who goes around from festival to festival and to believe what Sonia said, he is often there where she and Marie go to), asked Sandra if she wanted to go to the barricade to rest. In a fraction of a second, she was beside Sonia. She seemed to still have a harder time breathing than me, she who suffers from asthma. I then asked her if there were something that I could give her or do for her, because the last thing I wanted was her to collapse beside us. I think that I was still in shock that we were able to get all together quite quickly, I couldn't stop telling Sonia how fast I ran and she seemed to find it very funny that I was so drained and so surprised to be where I was. Afsha sent me a text message to tell me that she was in the first row completely up front on the right; she was so lucky! I was super happy for her! I learned a few days after the concert that my friend Isabelle and her friend Isabelle (whom I don't know personally yet) were also able to get a spot in the first row up front, just in front of the staircase at the right of the stage. I was really happy for them, because I learned that they had started to wait in line at around 6h30am in the morning of the show. Moreover, I learned that they had a few beautiful opportunities to interact with Jon during the show because of banners they had brought along. I couldn't stop looking at the crowd in the right part in front of the stage and by seeing how people were packed, I was quite happy to be where I was! We had space to move a little and I knew that I would not get pushed during the concert, because we were still about 100 feet away from the stage... There were already a few people in the ZAS and the VIP zone behind it. People on my right were talking together and someone mentioned that they were able to enter via the ZAS and VIP zone entrance while we were all packed at the other entrance! These people had arrived at the other entrance around 5h30pm and they were just behind us! Something to enrage the people who had waited very long in line standing up under the big heat! We waited an hour before the first act, The Rikers, went on stage at around 7hpm. I immediately put on my ear plugs to spare my ears. The music was not that bad, but the singer was arrogant, thinking he was someone more famous than he really was. It was a little weird... I was looking forward for them to end their set after half an hour! Sonia was applauding them after the songs while saying that it meant that she was happy that one more song was finished and that less were remaining! Throughout the whole first act, we had the sun in the face and it was very annoying! I was hiding from the sun with my hand against my forehead. I was looking forward for it to disappear behind the buildings on our right. I took a few pictures to test my camera; with the maximum zoom, I could still see quite well. I also decided to eat a granola bar that I had held on to when we had entered the site. I was not really hungry, but I was telling myself that I still had to build up strength. We waited until 8hpm before Dashboard Confessional, the second first act, went on stage. In between, I asked my husband to take a picture of me, Sonia and Sandra to immortalize the moment. Marie, who was on my right, was resting, and was sitting down against the barricade, at that moment, so I preferred not to tell her to stand up for nothing. People who were between me and my husband sat down for the picture not to be in the picture. For that matter, they sat down several times between the time they arrived and Bon Jovi went on stage. Afterwards, the man behind me clearly saw that my husband was behind him and he offered him his place, a thing that my husband refused kindly by telling him that he is used to standing back at Bon Jovi shows. The man was intrigued by what my husband was saying and I told him: "It's still the 19th time that I see them in concert!" He made me repeat the number of times, because he thought he didn't hear correctly. I was under the impression that I was more credible to his eyes and to his wife's eyes who was behind me! Oh yes, I am used to this circus now! Dashboard Confessional had been the first act for Bon Jovi in February 2011 if I remember well and Sandra and I had skipped the first act on purpose. We found out that we had done the right move, because frankly, the singer sang as badly as me! On the first song, I was looking forward for him to stop singing, because he was singing downright off-key! Sandra even said as a joke that if she came to have suicidal thoughts, this is the kind of music she would listen to to encourage herself! I spent the whole time of their show with my right elbow on the barricade to rest my head a little in my hand. My husband left to get farther from where we were just before Dashboard Confessional went on stage, because it must have been indeed suffocating in the crowd a little further. I learned afterwards by text message that he went to the hill on the other end, because he felt more comfortable there. The later it got, the more it was difficult to send text messages. I had to retry and retry; I could not send them 3 times out of 4. We were probably too many people concentrated at the same place and trying to send messages or to call at the same time. The cellular towers were probably completely overloaded with requests! We waited a good 40 minutes before Bon Jovi came on stage after Dashboard Confessional left at 8h50pm. The sun was no longer shining on us and I started being cold, so I put on my polar sweater, to Sandra's great despair who didn't understand why I had done that! I also put my banner about Bed Of Roses in my back left pocket just in case, to show it to Jon at the right moment. Sonia took out her camera to see if it were functioning properly. To her great and bad surprise, her battery was dead! She had mainly come to see Richie, her handsome splendid as she says, she seemed quite disappointed to know that her camera would not allow her to take pictures! I told myself at that moment that I would take pictures of her handsome splendid between 2 pictures of Jon, my own handsome splendid! At some point, I saw someone bring Jon's white microphone stand on stage. I told myself: "That's it, the next show is Bon Jovi! Yeah!" I was so tired at around 9hpm, I stood gaping in the air! Sonia and Sandra thought it was very funny and even teased me to tell me that it was my usual bedtime. As I told them, I go to bed later than that these days and I reminded Sonia that a few weeks ago, I had sent her an email at 10h15pm for work-related things. She told a bit of the story to Sandra who didn't quite know what we were talking about. Michel, the man who was on Sandra's left, was often talking to a man on his own left and they thought it was very special that we were so much big Bon Jovi fans, Sandra and I. They kept on asking Sandra questions, because I was a little too far away to understand what they were saying. At some point, I understood that they had asked Sandra if they had to worry if Jon passed by near us. Sandra reassured them right away by saying that he had already been close to us and she turned around towards me to tell them afterwards that they shouldn't worry about me, because I don't even budge to make a video when Jon passes beside me, as if it were nothing! I then added that I had already made a video with one hand without trembling while I was touching Jon with the other hand! They seemed impressed by my self-control! I started to be quite hectic at around 9h15pm! And I didn't have to go to the restroom yet, yeah! People were trying to make a wave on our right, but the wave didn't go very far towards the back and I heard other people behind us scream: "Bon Jovi! Bon Jovi! Bon Jovi!" At around 9h20pm, the introduction from the The Circle tour with words displayed in circle started playing on the giant screens. I told Sandra to look at the giant screen behind the stage and when she saw that, she started screaming, as several other people in the audience. Adrenaline was pumping in my veins, I was then super excited, like the beginning of all Bon Jovi shows I go to. The band arrived a few moments later, without Jon who was still hiding. When I heard the first notes of Raise Your Hands, I already knew that I would spend a very good evening. Jon even changed the lyrics of the chorus at some point to say: "From Quebec City to Chicago" instead of "From New York to Chicago". The crowd reacted very well! We had a hard time hearing Jon sing and talk during the show, so I had to have some details confirmed by my husband or by watching my videos after the show! In fact, we could have said that we heard Richie more than Jon at the microphone! It could be that the microphone adjustment was not well made, because usually, we hear Jon a lot more than Richie, even when we have a hard time hearing what Jon says. I didn't expect less than that as a set list of a show given during a festival: only hits or almost! In fact, the songs were rushing one after the other so well that at some point, I felt like a kid at Christmas who receives every gift she requested from Santa Claus. I had expected to hear 99% of the songs, so at each song, it was only the confirmation of what I was expecting. The only surprise that I got was I Love This Town! The show lasted from 9h20pm to 11h35pm; it was the shortest Bon Jovi show I have gone to until now if my memory is good. For every fan of statistics, I took 1378 pictures and made 20 videos. I took a lot less pictures than usual, because I was still a lot farther than what I am used to and my camera was often asking to use the flash, so the lighting was not ideal at all! It's not too bad, I am still not disappointed, because the videos are excellent. I have good memories and it allowed me to get a little more excited compared to the shows of the last years during which I took 4000 pictures! It was almost as when I was a teenager! And I will savor more future shows where I will be a few feet away from the band! I am more determined than ever to be close to the stage after such an experience! 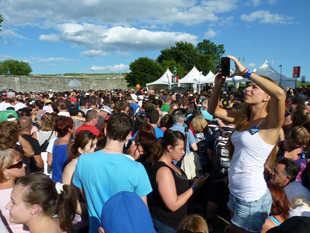 I found an official picture of the Festival d'été de Québec showing the impressive crowd of that night. I circled in red the approximate spot where we were. At the end, we were still close enough compared to the rest of the crowd. I decided to share with you a few of my best pictures that I was able to dig out among the ones that I took that night. At the end of Raise Your Hands, I knew that the band would go on with You Give Love A Bad Name and I was already hectic to hear the reaction of the crowd which was, let's say it, electrifying! If there would have been a roof over the plains of Abraham, I think that it would have blown off at that moment! However, what is too bad about outdoors shows is that crowd's noises, screams and singing get lost in the air, so it is less impressive than in an arena where it is closed. I think that it's just before You Give Love A Bad Name that Jon greeted the crowd of Quebec City, but I am not sure. I remember that he also mentioned that we were Monday night. I took a sip of water from time to time to stay alive, because with all these people who were smoking cigarette and other illicit substances in the surroundings, let's say that my throat was already hurting and I had a hard time breathing. I couldn't imagine myself wearing my contact lenses with all this smoke around! It was very easy to go drink: I would squat down, giving the chance to the people behind me to see the stage correctly for a few moments. I could still see the stage even when I squatted down, because there were holes in the barricade. It was a little weird in fact! I also took off my sweater after one or two songs, because I was starting to be hot! Never during the concert people pushed me or someone tried to come up front; we also had plenty of room to move, dance and jump up and down! I felt sorry for the people on the right up front who were all packed one on top of the others!! I turned around to see the crowd behind me several times during the show. I was very impressed to see the sea of people! And the effect of the little blinking lights from the lapel badges worn by the people was a big success; I could see how far the crowd spread over the plains of Abraham! Jon was in great shape, jumping a little everywhere on stage. However, I felt like he was not completely at ease at the beginning of the show; something seemed to bother him. He was not on a stage he was familiar with, it was maybe only that. I would say that he started being very comfortable during Bad Medicine! He started the show with his shades on, but he took them off after a few songs, because the sun had already set for a little while! He was wearing a black sleeveless shirt with a leather jacket with the colors of the American flag. He looked like Captain America with this jacket which was quite open at the beginning of the show, but I saw him pull the zipper upwards at some point. When Lost Highway started, Sandra looked at me, I don't quite know why. It is not my favorite song in concert, but since Jon's super reaction during the show on May 4, 2011 after having seen my banner that said that I was 35 weeks pregnant, I must admit that this song has a certain cachet now. It reminds me of so many good memories! Just before It's My Life, Jon talked to the crowd to say that it had been one year since the band had been on stage. I found his comment very strange, because Isabelle went to see the band in New Jersey during another festival in May 2012, that is not even two months before that night's concert... He also said that it was like riding a bicycle and he added: "If you are lucky enough, you get to ride it times and times again!" making a reference to the fact that he had been lucky to be able to continue to play on stage for so many years. Jon continued by saying: "We've got a long way to go, so save some of that energy, ok?" A few moments later, when It's My Life started, I felt a wave of screams flood from the hill towards the stage. The crowd's energy was really super, we could feel it up front! I was quite happy to hear Captain Crash And The Beauty Queen From Mars again. I had secretly wished that they played it since I had started working out outdoors, because it is part of my workout playlist. It is so lively in concert! At first, there were almost just the people completely up front, a few ones behind them and Sandra and I who were swinging our arms in the air to the beat. I was then wondering if Geneviève and Maryse could see us, because I had informed Geneviève when we arrived at our places about where we were. With only two people with their arms in the air at this place, I imagine that we could easily be spotted in the crowd... Towards the end of the song, Jon swayed his guitar from side to side to invite the whole crowd to swing their arms in the air to the beat with him. It was amazing! I was trying to see people farther away by looking behind me and with the help of giant screens and I can say that there were not many people who seemed to have their arms down. I adore this effect from the crowd! However, my fun was not complete during Captain Crash, because at a certain time, people behind us brought in catastrophe a man who seemed unconscious; they had lifted him up in the air, feet first and they brought him up to the front. There was a security corridor just in front of us, between the VIP zone and where we were. Security guards tried to provide him assistance until paramedics from Ambulance Saint-Jean arrived. He seemed in really bad shape. The man's spouse arrived at the front to the barricade shortly after to get news. The paramedics asked her if he were diabetic or if he had done drugs that night. She simply said that he had taken a beer if I remember well... Anyway, the guards were active near us, so we had our view blocked often! A few minutes later, the man was sitting down on the ground, he was smoking a cigarette and he was sending text messages! Security still didn't take any chances and the paramedics brought him away on a stretcher to a first aid facility. First, they headed towards our right to reach the middle of the crowd, a thing that I thought was really weird. We saw the stretcher come back after only a few seconds and everyone was then heading towards the left to get out of the crowd. The man seemed to think that it was funny or seemed to be overwhelmed, because he let himself be carried and he was slightly smiling from the corner of his mouth. It seemed like a bumpy ride in the sand while sitting down on a stretcher! In short, I didn't see much of Runaway with all these comings and goings! I just remember that Jon said that it had been 30 years since he had convinced a DJ to play his song on the radio and that he wanted to play this song to us, or something like that. We had a very hard time hearing Jon when he talked! Fortunately, I knew the lyrics of the songs, because otherwise, I would have not learned them by listening to Jon that night! Afterwards, Jon mentioned that it was Richie's birthday in 2 days (July 11). He said as a joke that he was going to be 21 once again... He then added: "At the end of the show, I'm gonna sell this guy to the highest bidder or the cutest girl." Richie seemed amused by what Jon had just said and he then pretended wetting one of his fingers with his tongue and bring it to his right buttock while making the noise of a wet object meeting fire (tsss) to mean that he was still "hot". It was very funny to see them kid around like that on stage! Afterwards, they started to play I'll Be There For You. It was weird to see Jon sing the song without necessarily hope that he would leave at a certain time during the show to appear a little farther in the crowd to sing a few songs... I even saw a lot of people holding out lighters in the crowd during the song. I told myself: "OK... Are we back to the 1980's-1990's with lighters held in the air during ballads?!" It reminded me of my first Bon Jovi concerts where several lighters were held in the air a few times during the shows. For your information, these last years, people turn on their cellular phones instead to create the same effect... Towards the end of the song, Jon made us sing the "oh oh oh, oh oh oh, oh oh oh oooooh". It was great to hear dozens of thousands of people sing as one. The effect gave chills! I was feeling really good at that moment, even if I were a lot farther from the stage than usual! After the song, Jon started singing "Happy Birthday Richie" and the whole crowd followed. Richie seemed really touched by the gesture! I was under the impression of déjà-vu with the show at the Parc Jean-Drapeau on July 13, 2006 when we had sung happy birthday to Richie spontaneously even before Jon asked us! I had quite a surprise afterwards when Richie took out his cowboy hat and his double neck guitar. Even before the first notes of Wanted Dead Or Alive were heard, I already knew that it was the song they would play. I was surprised, because usually, they play it a lot further in the evening than that! Jon made us sing the first verse; the effect was a real success and most of the people knew the lyrics based on the echo of the crowd singing! And another surprise came when Jon said: "And here's the birthday boy!" right before the second verse. Richie then got closer to Jon's main microphone and he sang the whole second verse! I love this kind of surprises! I was even able to make a video of Richie while switching his guitar right before the solo. I usually never think about making a video of this part, but I have always been impressed by Richie who switches guitars like that in a few seconds. This moment is now immortalized by one of my videos! After Wanted Dead Or Alive, Jon went to grab his maracas for Keep The Faith. At the first strokes of the maracas, I told myself that the challenge of getting a picture of Jon with his maracas not blurry was even bigger this time! I also realized during this song, and several times later during the show, that the people in the first few rows are the only ones who raise their arms during the strong moments of the songs. Of course, since I am used to being up front, I was always doing the same as the ones up front! Well, people behind me will probably have noticed that it was not my first time either! A little earlier during the concert, probably after It's My Life, I really wondered if they had forgotten to put We Got It Going On on the set list. I got my answer after Keep The Faith when hearing the first notes of this song! I was really happy to hear it even if I have heard it at each concert since the time it was first played in 2007! It's a real show song. Jon even took the time to get himself excited quite a lot, like back in the time when he had giant screen panels on which he could climb to go see the fans behind the stage. However, there was nobody behind the stage that night on the plains... Jon didn't make us sing at the end of the song, a thing that would have given an incredible effect! I was also very happy to hear Have A Nice Day even if I were expecting them to play it since it is a song which is still quite known from the band. I thought at that moment how well I could have said "have a nice day" in the way implied by the song to those whom I had passed during my run when entering the site! Someday I'll Be Saturday Night and Who Says You Can't Go Home are not my favorite songs in concert, but I must admit that people sang quite loudly the "It's all right!" of Who Says You Can't Go Home, creating a pretty crowd effect! I wondered probably during these songs if they had also forgotten to put Bad Medicine on the set list... I got my answer immediately after Who Says You Can't Go Home. Jon started Bad Medicine by asking his famous: "Is there a doctor in the house?" This moment, which usually goes unnoticed in my head, had a whole new meaning that night. I told myself: "Well, there is at least one of them I know anyway!!" I knew that an orthodontist from the Quebec City area with whom I collaborate for the part on the surgery on my website was there. From my passion, I had piqued his curiosity to come see this show. I think that he was not disappointed from the feedback I received from him after the concert! Anyway, Bad Medicine was memorable! First, the song is always excellent in concert from the energy released by the band. Despite my attempt to make a video of Richie during "You got a little but it's never enough", I was resigned: he would not do his characteristic gesture that night! Second, the mix chosen by the band during the song was my favorite mix, namely Old Time Rock And Roll! I had secretly hoped to hear it again when I had listened to the original version a few days before. This song brings back the memory of the strong moment of the show I saw in Foxborough in 2010 when Kid Rock had joined Bon Jovi to sing it! It's just a shame that I still don't know all the lyrics yet! But the party ignites each time the band members play it and it seems to me that they played a big part of it if they didn't play it entirely! Jon was then very comfortable on stage, he even sat down near David during the solo while switching his microphone from one hand to another and while dancing up and down. Jon rarely gets loose like that! When he went back on stage, Jon decided to tease us by wanting to start Shout with his wicked singing exercises. I told myself at that moment that it would be great if the band decided to play it this time instead of only tease us. I got my wish; Jon started singing it!! A lot of people were jumping up and down, me included, to the song's infernal beat. The crowd went totally crazy, a moment of pure happiness for the crowd. And they ended Bad Medicine as usual with Jon who thanked us for coming in such great numbers. The band then left to mark the end of the main part of the concert before the beginning of the encores. The crowd was crazy, chanting the typical "ole ole ole ole" of a crowd from the province of Quebec. In the meantime, Gilda, who was completely up front, was showing a sign on which it was written: "In These Arms". She wished to hear it, as probably 80% of the crowd. Anyway, I was part of this group, because the concert version is unique and it is always loaded with emotions. When the band came back on stage, the giant screen showed Gilda and her sign several times and at the first notes of In These Arms, Jon looked towards Gilda while making a sign that seemed to mean: "There, you have it!" She seemed hysterical from what I saw on the giant screen! In These Arms was true to its reputation, always as good in concert! When I saw the picture below, I clearly saw that the band had already planned to play it and it was just by chance that they started the song at the moment when Gilda showed her sign! In These Arms was on the official set list defined by Jon, but we clearly see that I Love This Town was added by hand; this one was not planned at first! Right before I'll Sleep When I'm Dead, Jon made us scream "1....... 2....... 1... 2... 1, 2, 3, 4" to make us count the beat. I quite love this song in concert as well, it is lively and Jon interacts a lot with the crowd, by making us clap our hands several times and the crowd always gets onboard! Right after, Jon went to the main microphone as usual and I had a feeling that he would start Livin' On A Prayer a cappella like he always does. However, before starting, he stopped and told us: "God, I forgot how much fun this is!" I was then telling myself: "Yeah! Jon, remember this! We also have a lot of fun coming to see you!" And he continued: "It won't be long until we move back on the road again and live out of our suitcase. The new record is done, it's in the can. I was going to play it for you, but in this day and age, it would be about and out but anyhow... Until I can play the new stuff, you're gonna have to rely on this, our national anthem." Of course, he was referring here to the fact that if the band had played new material, everything would have ended up on YouTube and it's probably the last thing he wanted, several months ahead of the album official release! Moreover, maybe the band wasn't quite comfortable playing the new songs... Anyway, Jon then asked David to start the song; I was really wondering why David had to start Livin' On A Prayer, but I had forgotten that piano notes start the song! We weren't lucky enough to get a part a cappella, but let's say that I quite loved to hear that the new album would probably be coming out within the planned delay, that is early 2013 for a tour in 2013-2014. Livin' On A Prayer was recognized by the whole crowd, triggering the crowd on site to go purely crazy. People were singing loudly and I even decided to appreciate the last minutes spent with my idols. I didn't take any pictures or make any videos starting from the middle of the song to savor the moment. Anyway, I could see on my left that Sandra was making a video of the whole song, so I told myself that I would have the chance to see this moment again a little later! The band members then took their official bow. The crowd was not ready to let them go and Jon was making his face of someone who didn't want to go just yet. The crowd's screams got the better of the band, Jon was quite easily convinced to stay. The band members gathered in a huddle as usual during encores which are not as planned just like a football team preparing a play. The band dispersed to allow each member to go back to their instrument and I saw Jon pretend to play the guitar at someone backstage to let him know that he needed a guitar. There seemed to be confusion on Richie's side as well, letting me think that this encore was maybe not as planned as it seemed! The lights went out on stage to let the band get organized properly while roadies brought the guitars and when the lights turned on again, Jon said: "I always knew that I liked this place..." WOW! I Love This Town! I know that I should take nothing personal, but for this song, I love imagining that the band only plays it in cities they appreciate more particularly. I savored it fully, because I knew that it was the last song. I could not believe that my 19th show was coming to an end! I had a nice moment with myself during the song. Near the chorus, the lyrics are: "Let the world keep spinning round, and round". The first time Jon sang them, I pointed my right finger in the air and I made circles with it above my head while singing with Jon. To my great surprise, Jon did the exact same thing the second time he sang the lyrics... I then told myself when I saw him: "Oh, I am hot, I anticipated what he would do!" I have probably never noticed, but he must have done it during a show I went to since the Lost Highway tour and that's why my subconscious made me do it at the first chorus! The band thanked the crowd once again and all the members left behind the stage. The giant screen started showing commercials and lights turned on on stage to allow the roadies to start picking up the instruments. The show was already over! Even if we are used to hearing 25 songs and more during shows when the band is on tour, I didn't expect to break records in show length and the number of songs played, because there was a curfew on site and it was still later than 11h30pm. I don't remember exactly when anymore, if it's towards the end of the show or after the band left the stage, but Marie turned towards Sonia and said that she would like to go buy a necklace like the one I was wearing at the tents which sold Bon Jovi things that day. I had decided to wear the necklace that I had bought during the Have A Nice Day tour. Sonia told her that it was no longer on sale since a long time. I found it strange that Sonia knew that, but it is indeed no longer on sale! From text messages (which were very easy to send now that the crowd was leaving!) exchanged with my husband, the game plan was to wait for him, because he knew where I was, unlike me who had no idea where he had gone to during the first acts! I didn't wait long until he arrived and we chatted a little with Sandra, her boyfriend, Sonia and Marie. We decided to leave the site afterwards. We didn't get stuck in a big crowd, people had left quickly by foot. We quickly lost Sonia and Marie who were getting back to take the ferry and my husband and I walked with Sandra and her boyfriend up to Château Laurier where they had parked their car; they had done a round-trip to come see Bon Jovi in Quebec City! Before leaving them, I thanked Sandra's boyfriend to have provided us the necessary security during the day and we all told ourselves that if there is a next time, we will purchase ZAS passes, even if we have to pay 600$! Since the beginning of the day, I regretted not purchasing a ZAS pass; it would have spared me so much stress and I would have been a lot closer to the stage! My husband and I headed towards the hotel where we were staying and I was starting to get really tired of smelling cigarette and other illicit substances! There were plenty of people who were smoking all these things around us in the streets! Beurk! When we arrived at the hotel, we gave our impressions of the show to each other and I went to take a shower. Strangely and to my great joy, I was not very dirty compared to when I came back from the show at Parc Jean-Drapeau where I had to wash myself twice to be able to remove the sand that had gone everywhere! The soles of my feet were hurting so bad by the fact that I spent more than 6 hours standing up without sitting down. And to my great joy, I didn't have to urinate as much as I thought I would! My strategy to drink sips of water from time to time had worked! I had been able to hold it in from about 4h15pm to 0h15am! Phew! We went to bed, but I had a hard time falling asleep, because I was reliving my evening in my head and I could not believe that I had been so lucky to be exactly where I had decided it would be acceptable to be under the circumstances... I had succeeded in turning the switch off completely from my life during the concert, forgetting that I do something else besides going to Bon Jovi concerts! It made me feel good to come out of my routine and forget everything apart from the fact that I was a big Bon Jovi fan! This morning, that is the next morning, I had the nice surprise when I woke up to see that I had not gotten a sunburn on the day of the concert! My back had become hot several times during the day, so I was afraid to have caught a lot of sun there. Everyone had seemed amused by my ugly hat, but it was useful to me for something at least! Anyway, we left the hotel early, because we had to go pick up our son at his paternal grandparents' in Sherbrooke and we had told my parents-in-law that we would probably have lunch with them on the way back. Before leaving Quebec City, we searched for the newspapers of the day and to my great joy, the 3 main newspapers were talking about the concert! While coming back to Montreal, I checked my emails on my iPhone and I saw that both hosts from Radio X had written to me to ask me if it were possible to talk once again that day live during their show in late afternoon around 3hpm! Wow! I dare believe that I did a good job on the previous day! After several emails and after talking to Martine over the cellular phone, they called me a little after 3hpm to ask my impressions on the concert and other questions about my passion. Dany insisted once again on the fact that he was talking to the engineer from the Canadian Space Agency whom they had interviewed on the previous day! I have never felt as important as that in my whole life! haha We had arrived home, but to avoid having my son wake up and disturb the conversation over the phone, my husband drove in the small streets of our neighborhood while I was finishing the interview! I think that I answered the questions well and strangely, I was not nervous at all to talk live on the radio. The answers were coming out easily; it was a very interesting experience! The whole interview can be listened to (in French only) by using the following plug-in or by clicking on the "Download" hyperlink below. Note: Like the first interview above, the whole show from that day is available on Radio X's website (in French only). When listening to Martine and Dany's show from the previous day while wanting to listen to my pre-recorded interview, I noticed that they had talked about me for a few minutes at the beginning of their show! You can use the following plug-in or click on the "Download" hyperlink below to listen to (in French only) this little part of the show on July 9, 2012. In conclusion, I must emphasize that my husband saw on the internet that we were about 80 000 people to go to this show. Bon Jovi's official website talks about 90 000 people instead... Several sources contradict each other as well on the time when the doors were closed for the show because the maximum number of people had been reached: some sources say 8h30pm, others 9h15pm... Anyway, it was full house! It's hard to evaluate how many we were at the New Meadowlands Stadium in 2010, but yesterday, it was probably the biggest Bon Jovi show I have seen in my life! At least, we largely exceeded the crowd at Parc Jean-Drapeau, for sure, so my wish to see the biggest Bon Jovi show in Quebec since the beginning of their career came true! My throat quite hurts today (and my voice sometimes breaks...) from being exposed to second-hand smoke and from screaming. My husband and I still have smells of illicit substances that reach our nose from time to time and we think that our brain is playing games with us, because nothing that we brought back from Quebec City smells that! There is nothing more to do than wait a few months for the announcement of the release of the new album and the new tour. Afterwards, the circus will start all over! I am already looking forward to it! In the meantime, I will continue to work hard to be able to go play hard in a little while. Like one of my supervisors would say at work: "When you work hard, you can play hard!"